My husband loves them! He says they are very comfortable, and wears them very often. They look nice with formal and informal cloths! It's very comfortable and stylish and light shoe. On of the best pair of Cole Haan’s that I have ever purchased. I usually wear loafers to work, but I wore these sneakers and got some nice complements. Very comfortable and elastic laces are nice. Wore the heck out of these last year, they're still in great shape and are extremely comfy. Holding up nicely, too. Would purchase more. Love them so much, I'm really about to buy another pair for later on. Great addition to my collection. Light weight. Can dress up or down. The shoes look great however they are very tight on the sides and there’s no option for wide size. I had to resort stuffing the shoes with socks and hopefully this would help expand it.. I have been a Cole Haan customer for about 8 years. That said, these sneakers rank as one of my top purchases. I have received positive comments from millennials. Great fit and style. A homerun!! These are very comfortable and stylish. Love them and recommend as nice casual shoes. Love the shoe - I just ordered a size too small. The appearance is really quite striking and the sole had a comfortable cushion also. shoe is stylish and comfortable. ordering on line was easy and delivery was quick. the shoe laces are elastic which I find annoying and difficult to properly and comfortably tie my shoes. Otherwise they are great. Great shoes, great color, very comfortable. These shoes define style, fashion and rules the streets. I do enjoy them every time I use them. Great style and comfort. The toes narrow but because the fabric is not stiff it was not a problem. My husband loves cole haan shoes, and likes to wear sneakers on the weekend, So i want him to be comftable but well dress. 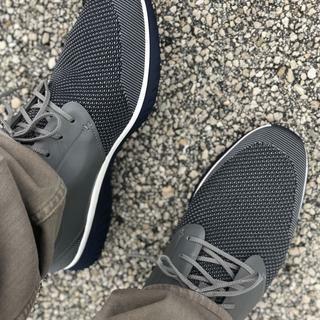 I have several pairs of zero grand shoes and I really like the shoes.I am willing to give the Grandmotion sneakers a try. great look at a great price too. I purchased the GrandMotion Saddle Knit Sneakers because of the stylish look and color. Moreover, I only wear COLE HAAN shoes because they are comfortable, durable, light in weight and the most stylish shoes on the market. Stop reading my post and start shopping. Great look for dressing up casual and they're supposed to comfortable, all day shoes. Stylish, versatile summer shoe that could be worn to work and a night out in the city. Completely unique shoe that can be dressed up and down. Looks fantastic. I own Cole Haan, So I know who well made they are. Very classy, comfortable shoe. Great look and lots of options on what to wear with them (shorts, jeans, etc.). Great looking walking shoe. Love the design. Repeat customer. Price point great..
My husband loves Cole Haan shoes, nice and confortable model. Have many calehaan shoes, love them all! This is a stylish comfortable shoe that you can dress up or down. Are thr air connor coming back? BEST ANSWER: No. Nike no longer owns Cole Haan, thus there will be no more Air Connor. The Air Conner was a great customer favorite for many years but is no longer available from us. We have some new plain oxford and athletic-inspired styles that would be a great replacement for that old favorite - check out the new Grand Motion Sport Sneaker and the Deconstructed Runner. BEST ANSWER: No I like them a lot. They’re stylish, lightweight and comfortable. I hope they will, but in a green. Hope so. They’re quite handsome. Do these come in size 14? BEST ANSWER: This style was made up to size 13 only. To view styles currently available in your size, use the drop down menus on the Men's shoe page. You can shop by size, width, style and more. Will any more color combinations be available in the Grand Motion style? BEST ANSWER: We don't get advance notice of styles or colors planned for the future, but since Fall 2017 is around the corner, I'd expect to see more GrandMotions in that collection. Keep an eye on the website!